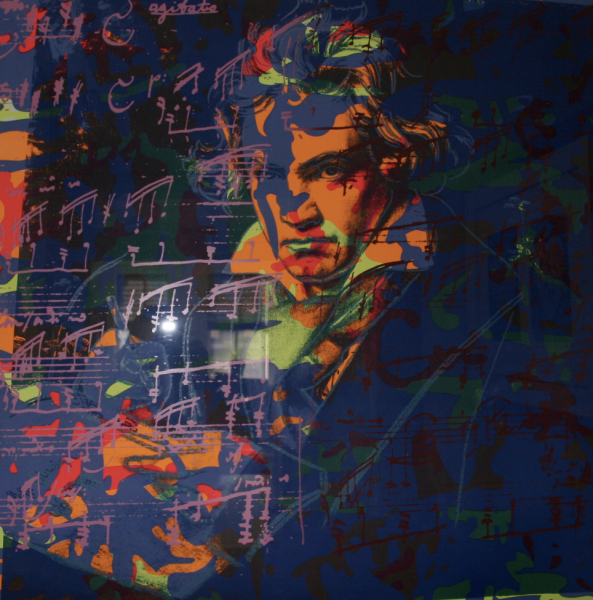 The Beethoven series does just that, Andy Warhol delves into his art like no one else can. He captures the musician in sharp engaging colors that shed a whole new light on the classical. sheet music, while also keeping the features of the portrait prominent. The soft melody of Beethoven’s enchanting Sonata No.14 is captured across Beethoven’s face in the form of notes. The notes, like the melody, are drawn graceful as not to overshadow the man of the hour: Beethoven. Warhol created this series in 1987, shortly before his death. What is so unique about this series is how it contradicts the common-held perception that Warhol’s subject matter was limited to movie stars and grocery store items. This portfolio of four screenprints, which features an image of Beethoven in different color variations, remains one of the most sought after prints of Warhol’s collection. Andy Warhol’s Beethoven portfolio captures a Genius admiring another. Warhol captures Ludwig Van Beethoven like no one else. He transform this composer into a rockstar. The portfolio consists of four screenprints on Lenox Museum Board and one Camouflage trial proof. Andy Warhol’s Beethoven portfolio was printed in 1987 by Rupert Jason Smith in New York and published by Hermann Wunsche, Bonn, Germany. Warhol’s Beethoven prints are among of his most desirable screen prints, for music and art lovers alike. ints, for music and art lovers alike.